For almost every day of the past semester, there has been something in the news about proposed budget cuts or streamlining of the university in the name of efficiency. The AEM (Applied Economics and Management) Program is probably the biggest target of the streamlining arguments, and not without good reason. Someone could effectively obtain a business major through AEM in CALS, PAM in Human Ecology, or by concentrating on a particular field within the Hotel School. The engineering school has a program set up with CALS where engineering students can minor in business through AEM. Some aspiring entrepreneurs take classes at the Johnson as undergraduates. Point is, anyone whose interested in business (if at least because of the big financial rewards) can do so. AEM hasn’t always been the fast track to I-banking as it is often seen today. The AEM of competing business fraternities, Wall Street ambitions and pre-MBAs is largely a recent phenomenon.The history of AEM shows how much of a radical departure the program has made in recent years, and thankfully a professor emeritus of the department recorded it in a written book about the history of the department that is available online in its entirety. AEM started in CALS for good reason — it was first known as agricultural economics. The program has its earliest roots from around 1903, when Ag school dean Liberty H. Bailey hired Prof. Thomas Hunt, who taught the first courses on farm management. By 1907, Hunt left to become a dean of the Penn State Ag school and George Warren took over most of his duties, becoming a full professor of the Farm Crops and Farm Management Department by 1910 (the sister department at the time was Rural Economy). George Warren by and large shaped much of the early development of the program, hence Warren Hall’s dedication to him when it was built in the early 1930s. In 1919, the two sister majors were merged into one department to be called Agricultural Economics, as ordered by the Board of Trustees. For the next several decades, Ag Economics was a major usually taken by farm kids who planned on going back to the farm or engaging in some other form of agricultural operations. By the 1970s, the program had begun to diversify somewhat, and by the 1980s the program offered a substantial number of courses that didn’t focus as much on the agriculture portion of ag economics (mostly these new offerings were in environmental and managerial economics — the managerial portion could be seen as a predecessor to today’s AEM). To reflect this, the department changed its name to Agricultural, Resource, and Managerial Economics (ARME) in 1993. Unfortunately, the book ends off in early 2000, and a lot has changed in the past nine years. The program changed its name from ARME to AEM in 2000. The undergraduate business program was accredited in January 2002. Doing this required a significant financial infusion on CALS’s part, one example being the hiring five key staff members that were required for full accreditation (for ratio purposes and course requirements needed for accreditation). Depending on the year, AEM has offered anywhere from six to ten concentrations, some ag based and some not. This is where the blurring has resulted from. So, we have the kids who come straight from the farm and want to pursue agricultural objectives. That’s right in line with CALS’s objectives. But then you have the kids who are completely set on Wall Street and Wharton. the ones who scowl when you mention that CALS is state funded or poo-poo most of their intraschool brethren (I know that they’re not all like that, but all it takes is a few to set a bad example and garner a poor image). The department has definitely become more diverse, but some argue that it comes at the cost of diluting the mission of the school (of course, who am I criticize when CALS also includes atmospheric science [meteorology, which grew from crop and soil science], landscape architecture and and communication)? Should AEM be streamlined? It would seem appropriate when you consider the variety of business programs Cornell offers. But to be frank, CALS does not give a damn what Cornell as a whole thinks when it comes to AEM. CALS invested heavily in the program in the late 1990s and early 2000s to get it accredited and propel it into the top ten in recent years. Why would they let someone deprive them of lucrative business majors (who become lucrative alumni) after they worked some hard to lure them into the program? This is more of a problem than people seem to realize. Unfortunately for me, my adviser rants about AEM’s high-and-mighty attitude roughly twice a week, so I won’t be seeing an end of those complaints anytime soon. As anyone who doesn’t live under an Ithacan rock knows, Cornell had its much-publicized and anticipated match against Harvard on the ice of Lynah Rink last night. Much to Cornell’s delight, the Big Red skated to an impressive victory over the Crimson, with a final score of 6-3. I feel like I’m one of a handful of undergrads on this campus who really doesn’t give a damn. Not that I don’t have respect for athletes at Cornell. I give them by full respect. It’s just that I have never followed sports, with the slight exception of cross country and track back in junior high and high school because I was on the team (and let’s be honest, they’re just not the same when it comes to skill or competitive spirit). I’m content to sit back and watch everyone else get excited, because I’m just disinterested in Cornell sports. I’m never sat all the way through a Cornell game in any sport. So, unsurprisingly I never mention sports on this blog, unless there’s historical worth to mentioning it. Which I can briefly do now. Back in the day of the university founding years, the big sport for students to follow was crew, aka rowing. A.D. White was a member of a rowing club during his own collegiate years at Yale (Bishop 33). The first boating clubs formed in 1871, and a regatta was held the following spring (if you could call it that). The first big victory came at Saratoga in 1875, much to the joy of the school and the town (story goes that A.D. White broke into McGraw Hall Tower and rang the chimes himself). Baseball and football were vague diversions, not even intercollegiate until 1874 (Bishop 134). Cornell actually had its own rules of football that no one cared about, so the university didn’t take a substantial interest in football until about 1886. The Cornell Atheltic Association formed in 1889 (296). The first athletic area, built in the same year, was off campus on what is now the site of Ithaca High School, and was called Percy Field after the donor’s son, who was at the time a student athlete at Cornell. Hockey was recognized in 1900, basketball a year later. Lacrosse started up in 1885, but was like clothing fashions among students, coming back into and going out of style every few years. Hockey was originally played on Beebe Lake. 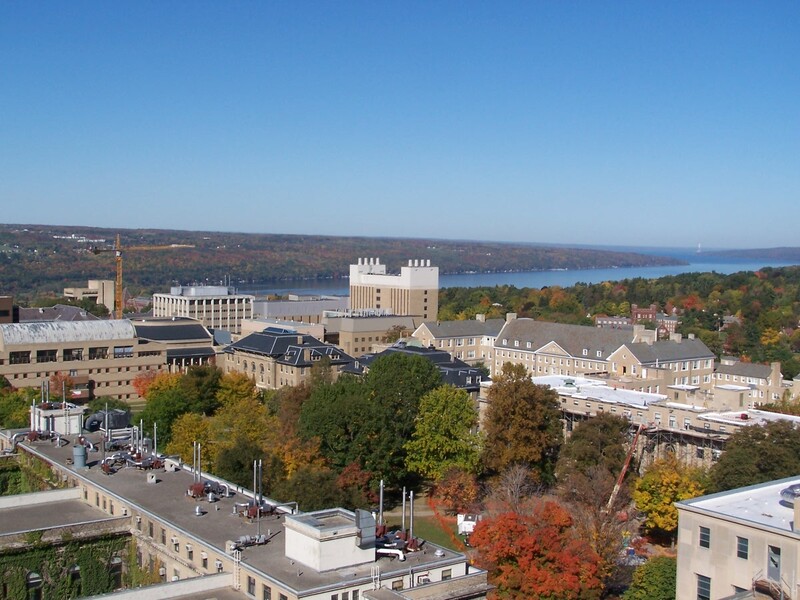 The idea of bringing it to Cornell came from a professor of engineering named Johnny Parson. Hecne, the establishment of the Johnny Parson Club. When the lake began to melt, the team would use the Ithaca city ice rink. The team won what might be its first intercollegiate championship in 1911 (417). So, Bishop’s history of Cornell only mentions hockey twice, and was published in 1962, suggesting the sport was still on the periphery of athletics at that time. That was also the same year that underdog Cornell outplayed perennial powerhouse Harvard. Things started to get more interesting when the Harvard/Cornell hockey rivalry started to heat up in 1973 with Harvard’s tossing off a chicken at Cornell goalie Dave Elenbaas, as a knock against the Ag School (of course, nowadays we can depend on our alumni to knock the ag school). So Cornell students responded later that month by throwing fish onto the rink. As the decade wore on and Harvard’s program weakened, the Big Red wasn’t content to let things slide, so the rivalry has been intensified since the incident. So that’s why Cornell-Harvard tickets can be so expensive, and why this one game is as close as Cornell gets to the storied rivalries of Big Ten schools. Some of us are more into it than others though. I do not condone sneaking into private property to take construction photos. That being said, if I receive them I’m more than happy to post them as the ones seen below. Most of the photos would appear to be of the parking structure in the lower floors of the building. Too bad some of the exterior photos are a little blurry.